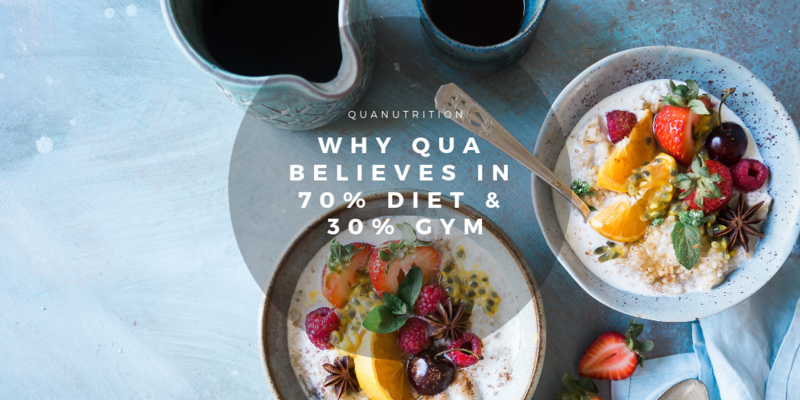 Why Qua Nutrition believes 70% diet and 30% gym? A fit body is made in the kitchen and not alone in the gym, this is what we believe at Qua Nutrition and always recommend to everyone to focus on the ratio of 70% diet and 30% gym. Here’s a lesser known fact that about fat loss tip that may surprise you. A lean and fit body are made in the kitchen and not in the gym. That’s right, it may come as a shock but 70%-80% of your fat loss results are determined by the food you eat most of the time and another issue that matters is how you workout because you have to manage 70% diet and 30% gym to see the real results. You don’t give much thought to whether the food you are about to eat will push you towards or farther from your health goals. Your eating habits impact your health blueprint. We divide the food into two categories. First is the one where the foods make you more healthy and help us build a little leaner. However, Most of us are inclined towards the second category which somehow contributes to deteriorating your overall fitness. The blueprint of perfect health and fitness is definitely not isn’t about starvation or depriving yourself of food. We are here to teach you strategically use foods to help you turbocharge your fat loss and maintain your results for long terms of course. The modern foods are incredibly addictive, when you eat foods that contain sugar, gluten, simple carbohydrate and cheese, they trigger the same chemicals in our brains that are released by street drugs like cocaine and opium etc. You might have found yourself unable to stop feasting over pizzas, pasta or French fries. It is because it’s loaded with sugar and gluten. Sugar, moreover, is the most addictive substances on the planet and not to mention one of the recognized poison known to humans that accelerates every degenerative disease. A recent study at the University of Bordeaux where they fed lab rats a steady diet of sugar after just three weeks, the rats were clinically addicted. When these rats were given choice between sugar and cocaine, they chose sugar even that they were addicted to cocaine. They switched over to sugar once they were given the choice. But did you know that Humans and rats share their 98% of the somewhat same DNA? Humans too have the sweet receptors. We at Qua Nutrition, have developed a number of scientific methods to help eliminate the unwanted cravings. As the best dietitian in India, we can surely say that the key is to start replacing these sugary items with healthier options like proteins, fibers, and healthy carbs. You would gradually want to wean yourself off these chemicals by having them less frequently. You will find a few bites suffice. You will be able to focus on the 70:30 diet to exercise formula. We believe that Abs are made in the kitchen rather than the gym alone. This is why Qua Nutrition claims it is 70% diet and 30% gym.